Apparently unusually high temperatures caused a massive and sudden breakup of river ice, and an ice jam 10 miles upriver from Eagle ended up wiping out the old town and most of the new one. Eagle and the nearby town of Chicken are colorful outposts with a mining history and there was a military base near Eagle as well. I’ve wanted to visit there for awhile. They have (or had) substantial architectural assets. I checked out their inventory of historic buildings at Library of Congress just a few months ago. Eagle, AK "Customs House". Originally noncommissioned officers housing at nearby Ft. Egbert. Built 1900, destroyed yesterday. The catastrophe isn’t over yet, but no deaths or injuries thus far. 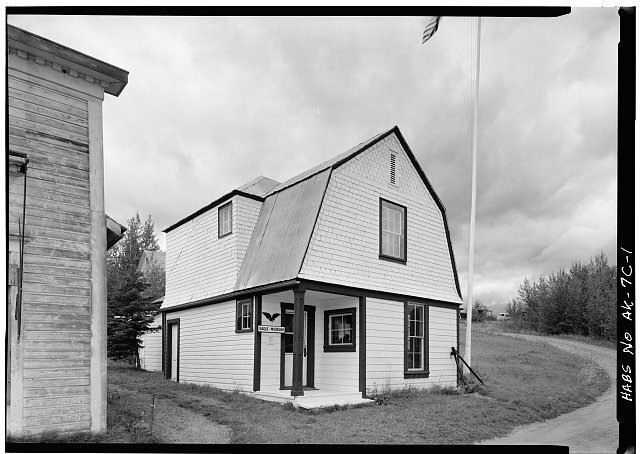 Image credit — Library of Congress, Historic American Buildings Survey. Jet Lowe, photographer, 1984. Update 5-6-09: It isn’t getting any better today.